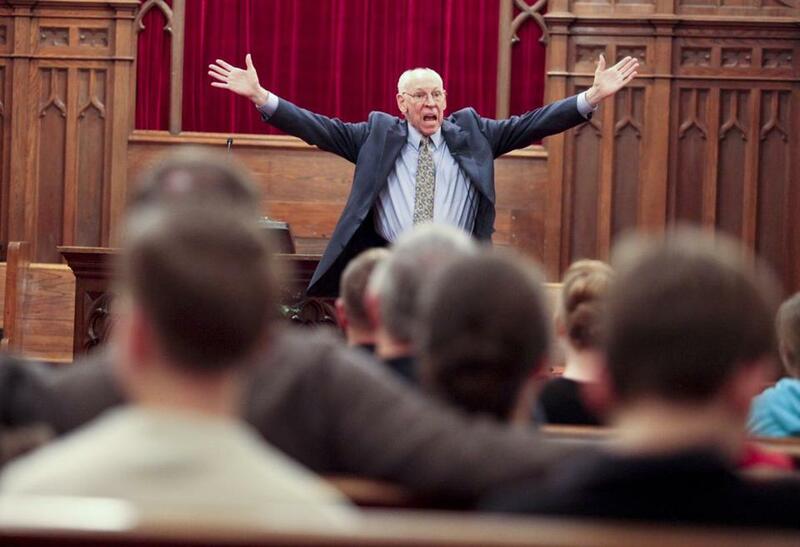 Rafael Cruz, the father of Senator Ted Cruz, spoke during a service at Wesleyan Nazarene Church, in Davenport, Iowa, on Sunday. MARION, Iowa — The Texas pastor paced before the wooden cross in a rural church, pointing toward the heavens as he lamented the sorry state of the country. Cast your vote in the Iowa caucus, he exhorted the congregation, and reclaim America! Meet Rafael Cruz, Ted Cruz’s 76-year-old father, a crucial — if sometimes divisive — element of the Texas senator’s campaign to win over conservative Christian voters. The senior Cruz’s crusades at churches across Iowa have paid big dividends; with strong support among evangelicals, Cruz has pulled within striking distance of front-runner Donald Trump in next week’s first-in-the-nation caucus. Rafael Cruz has drawn criticism for making incendiary statements: He has compared President Obama to Fidel Castro and advocated that the president be sent “back to Kenya.” He accuses gay activists of trying to legalize pedophilia. He contends public schools are brainwashing children with secularism. But among many Christians here, he’s preaching to the choir, drawing cries of “Amen!” “Preach!” and “C’mon!” from the pews. 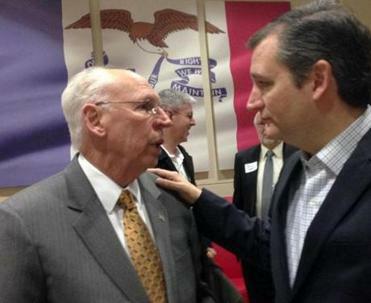 For more than a year, Rafael Cruz, a trim, spry man with a ring of white hair, has been preaching the same fire and brimstone sermon at churches and in private meetings with pastors all over Iowa and the country, on a mission to rally this critical demographic toward political activism — and support his son for the presidency. Emergency eye surgery sidelined him from the campaign trail for three weeks, but now he is back on the road. As Ted Cruz embarks on a final barnstorm through Iowa’s pizza parlors and steakhouses, the elder Cruz is on a parallel track, hitting two to four churches a day. Since Rafael Cruz was the subject of negative media attention early last year, the campaign has tried to keep him somewhat less visible, declining to publish his schedule or grant most interview requests. The Globe found him through the state’s network of Christian activists and briefly interviewed him at a dinner with pastors in Des Moines, where Cruz worked the familiar crowd, embracing the clerics and their wives as his son posed for photos and signed autographs. When Rafael Cruz was asked by a reporter to respond to critics who dismiss his views as extremist, a campaign aide hovering nearby whispered to him not to answer. The advice was ignored. 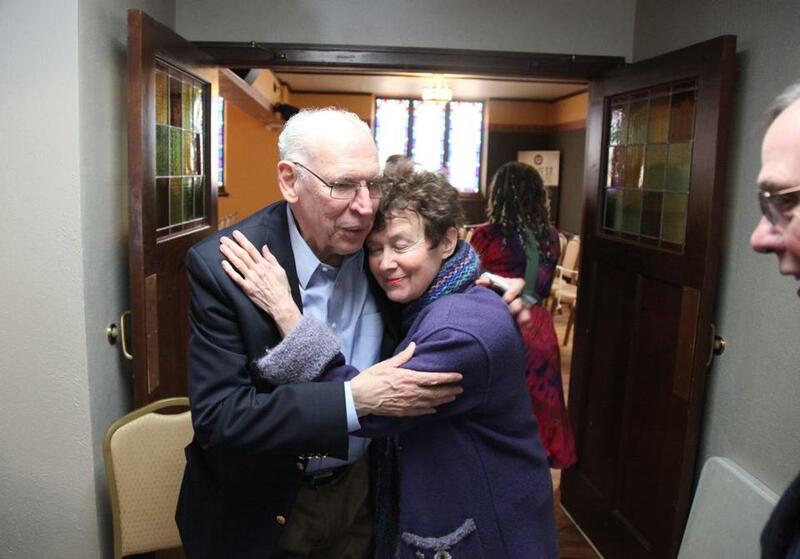 Rafael Cruz got a hug from Cheryl Kutscher, of West Des Moines, at his book signing at Harvest Bible Chapel in Grimes, Iowa, on Saturday. Ted Cruz said in an interview that his father is a powerful voice for freedom and that his message should resonate deeply even among non-Christians. Christian conservatives say they are particularly drawn to Rafael Cruz because of his dramatic life story. He was an active opponent of Cuba’s Batista dictatorship who fled to the United States in 1957 on a student visa and $100 sewn into his underwear. He studied math at the University of Texas Austin, learning English by watching movies and supporting himself by washing dishes. He and his second wife, an American, eventually moved to Canada, where Ted Cruz was born in 1970. But Rafael Cruz, an alcoholic, abandoned his wife and toddler son and returned to Texas. It was there that he found God, leading him to reconcile with his family in 1975 and bringing them back to the United States. By the time Ted Cruz was 9, his father was providing heavy doses of conservative Christian politics at the dinner table. By 13, the younger Cruz had memorized the Constitution and through high school toured the state of Texas, delivering speeches on free market economics and the Constitution. Emphasizing the family’s religious ties within Iowa’s Christian community seems to be working. While Trump is holding on to a lead of around 5 points, Ted Cruz remained the favorite among evangelical Christians, according to the latest Des Moines Register poll: 37 percent of self-identified evangelicals or born-again Christians supported Cruz, compared to 17 percent for Trump. Ted Cruz spoke with his father. Of Iowans who have said they plan to caucus next week, between 40 and 50 percent identify as evangelicals, said J. Ann Selzer, pollster for the Des Moines Register. The elder Cruz, many evangelicals say, speaks to the authenticity of Ted Cruz’s relationship with God. That’s a key reason he won the sought-after endorsement last month of Bob Vander Plaats, president of The Family Leader, an influential Christian advocacy group. “He’s a clarifying check that Ted’s the real deal,” said Vander Plaats during an interview from his Urbandale office, half a mile from Cruz’s Iowa headquarters. Pastor Joseph Brown, head of Marion Avenue Baptist Church in Washington, Iowa, leads 99 Pastors for Cruz, a grass-roots effort to secure an endorsement from a pastor in each county and use their built-in audiences every Sunday to propel Cruz to a win. Brown, who had not previously inserted himself in politics, said he came up with the idea after listening to Rafael Cruz challenge pastors to get involved. “Rafael is what has driven the evangelical vote in Iowa, definitively,” Brown said. On Saturday, as Ted Cruz held a rally with radio host Glenn Beck at a Baptist college in a Des Moines suburb, Rafael Cruz and Deace autographed copies of their new books at a church 16 miles away. “I give action steps here, what people need to do to get involved,” Cruz said. The couple, Cheryl and Dave Kutscher, bought two copies, so they could read it simultaneously. They said they support Ted Cruz, in large part because of his father. “If Ted ever got out of line, Rafael would put him back in place,” said Dave Kutscher, a land developer. “The devil overplayed his hand because this decision has acted as a catalyst to awaken the sleeping giant,” Cruz said, his voice booming through the church. He never mentioned his son’s name. On Monday, about 150 Iowa pastors attended a private dinner at a Des Moines airport hotel hosted by David Lane, a Christian activist from California whose group, American Renewal Project, mobilizes pastors to run for political office. The dinner served as a final opportunity for pastors to hear from Ted Cruz himself. Lane, who allowed the Globe to attend the closed event with the agreement of the campaign, has hosted similar dinners for other candidates, including Mike Huckabee, Rand Paul, and Marco Rubio. But Cruz has drawn the largest crowd by far, double that of Rubio’s, Lane said. As guests dined on honey pecan chicken and strawberry cheesecake parfaits, Ted Cruz delivered his father’s mantra of the importance of voting on biblical values. Sitting a few feet away, Rafael Cruz looked up at his son and beamed.